'Edge of Spider-Geddon' TPB review: A reminder of how deep the Spider-Man characters go – AiPT! If you were a big fan of Spider-Verse you’re probably a shoo-in for Marvel’s sequel Spider-Man multi-verse story. It recently wrapped up, which is probably why Edge of Spider-Verse is out in trade paperback this week. In the four issues collected here Christos N. Gage, Aaron Kuder, Jason Latour, Jed Mackay, Lonnie Nadler, and Zac Thompson give us a bit of backstory on specific Spidey characters before they enter the war of wars. This book serves as a primer for four specific Spidey heroes: Spider-Punk, Peni Parker and SP//dr, an Uncle Ben/Peter Parker duo, and a Norman Osborn Spider-Man. Things get crazy in here folks. Sandoval knocks the opening chapter out of the park, visually. This is an interesting read in one sitting due to there being a lack of a backbone to the overall narrative. This is more of an anthology dabbling in each iteration of the hero so we know where they’re at when they enter Spider-Geddon. If you’re a lover of Elseworlds tales you’ll dig it. The second chapter is good, focusing on Sp//dr and Peni Parker. This chapter is quite economical, dropping you into Peni’s world and introducing a new character right off the bat. Writers Lonnie Nadler and Zac Thompson tap into the unique nature of this hero who is still only a high school kid but also fighting giant monsters in her spare time. What draws you in the most is the parental figures Peni has in the story. They aren’t your typical parents, far from it, and are more like mad scientists who have a kid to support in her superhero work first. This issue doesn’t quite get into the dysfunction of that, but you can read in between the lines. The Uncle Ben third chapter by Jason Latour hammers home the interesting dynamic between him and Peter. Latour does a good job of establishing how Uncle Ben being alive has changed Peter’s outlook on being a hero too. Tonci Zonjic’s art hammers home an embittered and gritty lifestyle Ben has taken on to keep his family safe. The final chapter is focused on the Superior Octopus issue by Christos Gage and Mike Hawthorne. This issue establishes the character’s new lease on life in San Francisco quite well. The Spider-Punk story is drawn by Gerardo Sandoval who does a good job making the world look edgy. The punk focus is obvious from the get-go. There’s also a fun use of double page layouts that keep things interesting. The Sp//dr story is drawn by Alberto Alburquerque with colors by Triona Farrell, who work together to keep the art feeling fast and loose. I got a kick out of the designs of the villains who invoke the classics but have a nice spin on them too. There are some excellent facial expressions from Peni throughout to help remind us she’s a kid who reacts to things in big ways. The colors are a bit subdued, giving the work a more realistic, gritty feel when it could have easily swung into a cartoony look. Love how Tonci Zonjic draws the webs here. I wouldn’t say this is a cash-grab per se, but it’s certainly not a necessary read to get into Spider-Geddon. This book does give a few hints in the last chapter as far as what is going on, but this is more of an exploration of the characters who all made big appearances in Spider-Verse. That makes this a fun character study, but not much more. In that regard, some of the chapters in this collection miss the mark. 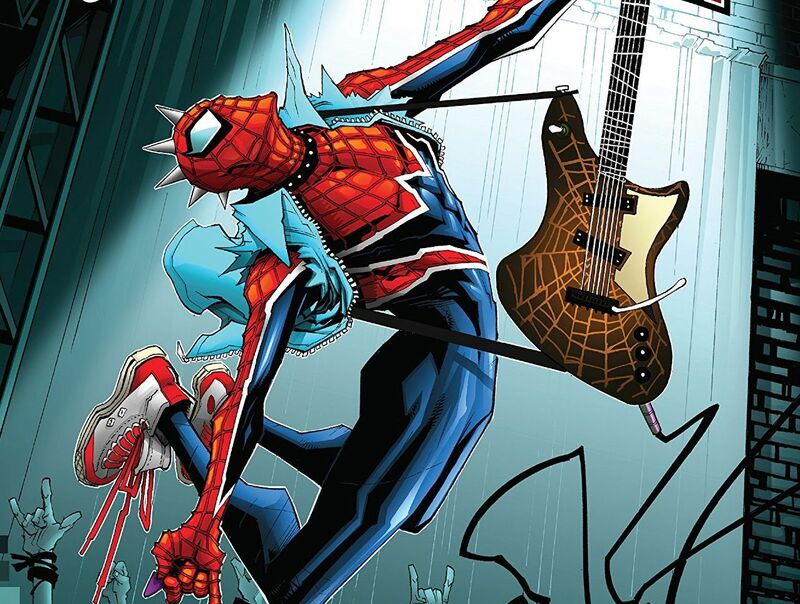 The Spider-Punk story is paced poorly with overly wordy sections and a main character you won’t care about. The Aaron Kuder written and drawn Norman Osborn story looks great, but again, the focus seems tilted way too much in reminding us he’s bad and not much more. The Superior Octopus issue also seems a tad off since it’s set in the main universe. Marvel seems to have slapped it into this collection for the sake of it, although it does help set up the character for Spider-Geddon. It’s fun to go back and reread these prequel tales to the main event. Strong character work and even better art make this a winner of a series, but don’t think you have to read it to understand Spider-Geddon.